One of my new year's resolutions was to sew more and since Jan first I've managed to finish four - yes four! sewing projects. For being one of the slowest sewers I know, this is unheard of. I bought a 6-foot folding table, which means I no longer has to do all my fabric cutting/set up on the floor. I also means I can leave my stuff out instead of having to pack it up between sewing sessions (thanks to a very gracious Mr. Cleaver, since my sewing nook is in our bedroom). I have embraced the quick & dirty sewing project. 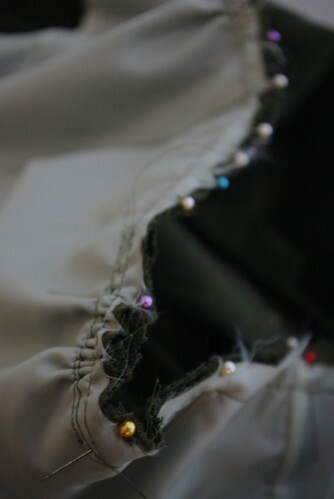 I'll admit that I have a strong preference for garment sewing over craft sewing, particularly if that garment comes with a large number of pintucks/pleats/darts/gathers/buttonholes or other lovely details that inevitably make the project take forever. 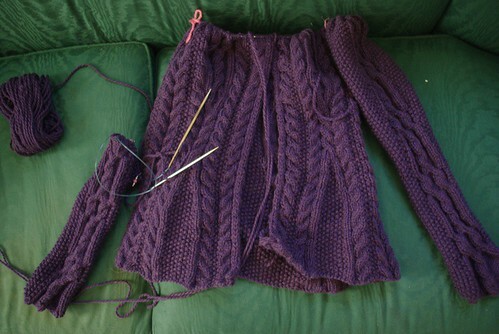 That said, of the four projects only one was a garment (which I'll post about in a few days - let's just say today is my MIL's birthday and we're celebrating later in the week due to the crazy weather we're having). 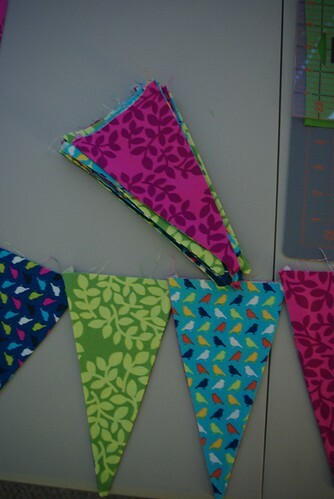 The other included a cheery bunting and table runner set for my pie potluck. The bunting was roughly based on this tutorial, while the table runner was improvised to use up all (and I mean all) the scraps from the bunting project. The with the runner I threw my perfectionist tendencies to the wind and eyeballed and zig-zagged my way to a cute little decoration. 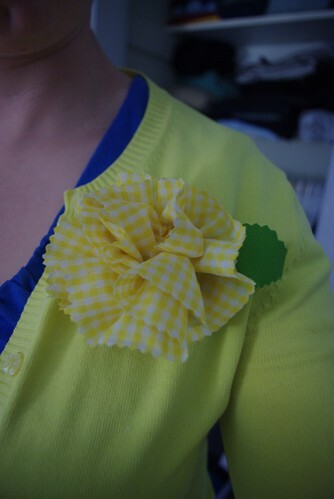 My quickest project was this 5-minute flower brooch I whipped up last night on a whim and that totally brightened my day today as I wore it. Of course all this rapid-fire sewing wasn't without its trials: I broke my seam ripper a few weeks back, so any undoing was a challenge and there was a lot of undoing because my sewing machine seems to be firmly set against doing anything other than a straight stitch in a forward direction - any attempts to back stitch or zig-zag generally were followed with bobbin-rethreading and mild curses. Sew Mama Sew is hosting a Sewing Machine Meme (it rhymes!) so I thought I'd join in the fun. Mostly clothing and the occasional bag or pillow cover, but by and large clothing. During the summer I probably sew 6 hours a week. In the winter about 6 hours a month. I like that it's straight forward and simple, it's a very unintimidating machine and had a low cost of entry. It desn't do anything fancy, but it gives me all the basic stuff I need to make my projects. I wouldn't say I'm passionate about it, I think I'd like something a little sturdier, more metal/less plastic, but I think I'll probably hold onto this one for another two years at least. The 4-step buttonholer is clear and easy to use. The feet are super easy to change and the darning plate is easy to install. The instruction manual was a bit more detailed, because there are some slightly more complex stitches (like an invisible hem st, I think) that aren't well explained. Overall, I'm pretty happy, wish it had an overlock st of some kind though. Do you have a great story to share about your machine (i.e., Found it under the Christmas tree? Dropped it on the kitchen floor? 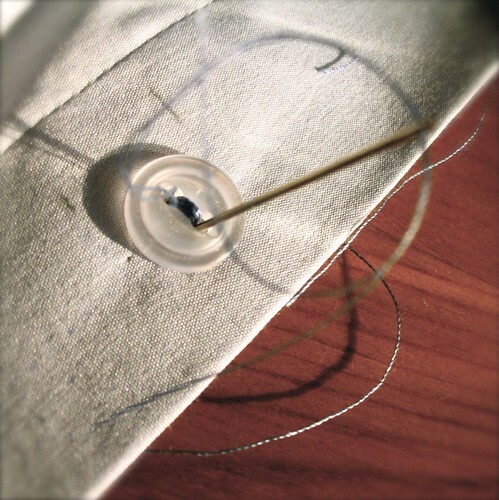 Sewed your fingernail to your zipper?, Got it from your Great Grandma?, etc.!)? We want to hear it! My machine was a gift to myself, paid for with the stipend I earned from stage managing. I bought the first pattern I sewed on it about 3 weeks before I could actually get the machine because I was so excited to get started! It's a great starter machine. It probably won't last forever, but I think I'll probably choose to upgrade before it wears out. I would recommend it to beginning sewers any day. What are you primary planning on making. Do you want to embroider or monogram anything? 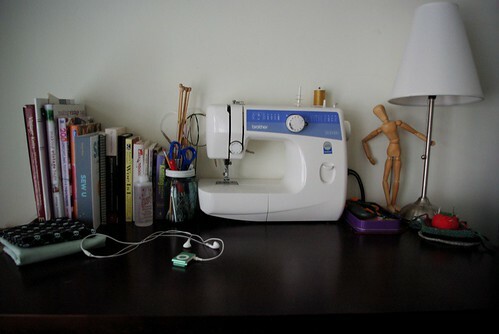 Do you have a dedicated sewing table or are you constantly going to have to move it around? Think not only about your current skill set, but what you dream of doing later. 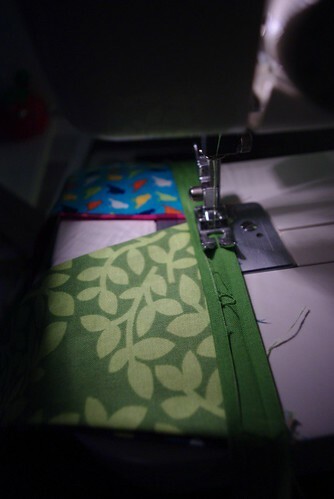 I don't know what it is about the week leading up to a big to-do that makes me want to sew so much, but it seems like whenever would be the least likely time to whip out the machine is exactly when I choose to do so. I'm going to admit. I'm not an everyday stitcher. I'm not even an every-week sewer, but book me a plane ticket out of the state and I'll set up the machine in the dining room. I, of course, realize that some of this has to do with my need to show-off (seriously, I have a blog to document it all for goodness sake). Mothers and mothers-in-law are great audiences for showing-off my handmade stuff. This time around, I'm doing crazy-tons of theatre stuff and I make a shirt. I know you were expecting "dress," but I'm branching out. So yes, I made a shirt. 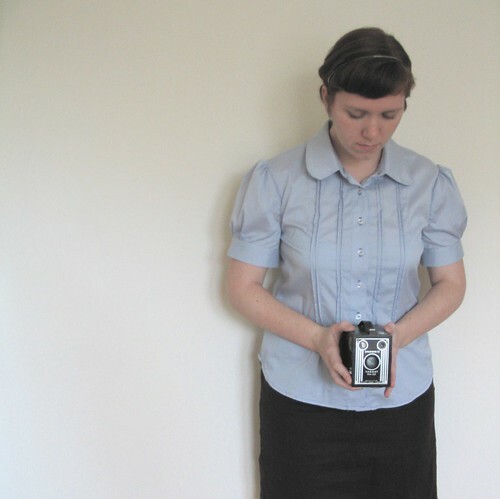 The last time I made a shirt, I was in high school and it was a very simple, very boxy men's bowling shirt and my dad got one of the folks at his work to stitch "Miss Leah" over the pocket. I still have it, and maybe after I add some much-needed darts to it, I'll post it here. But after a 7 year or so break from shirts, I decided to dive back in again. You see, I have this *crazy* idea about slowly crafting an entire wardrobe - except t-shirts and underwear, because I'm not that crazy. Of course, about halfway through the shirt I realized that I didn't have a clue how to make buttonholes on this machine. Let me say, I love the buttonholer on my machine. Love it! 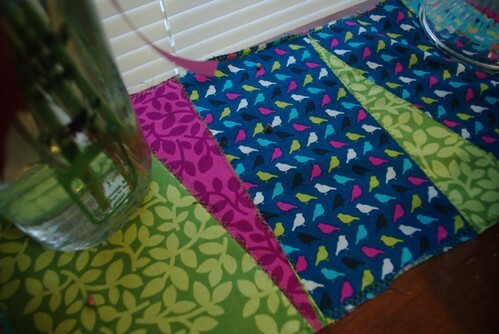 It made the whole process so easy I just want to run around putting buttonholes on everything. Forget cute as a button, how about cute as a buttonhole? And the more I type "buttonhole" in a row the less it sounds like I should be typing buttonhole. 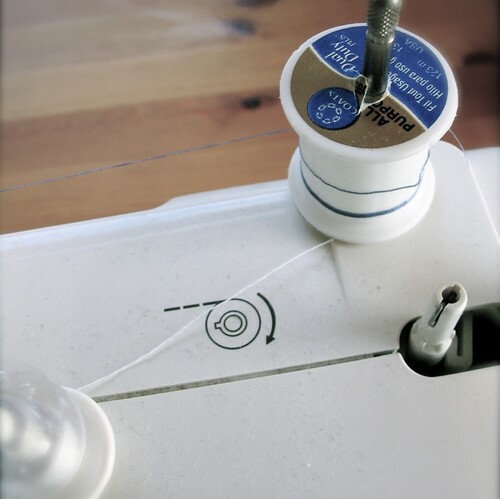 Also - did you know you can sew on a button with a machine? I'm so excited by this development in my life! 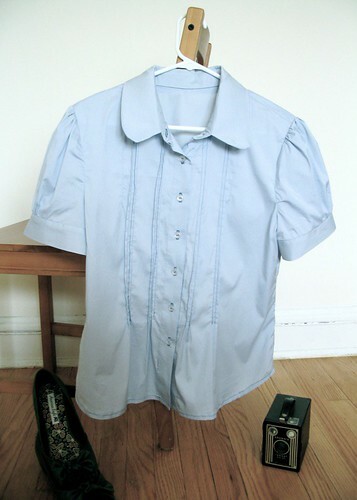 This was definitely A learning shirt, between the pin-tucks and lots of curved seams. But I'm super-proud of the hem and it was the best go I'm had with sleeves recently. So it's all to say I'm getting better - even if the collar on this shirt is a bit of a mess. PS - for those who are curious. 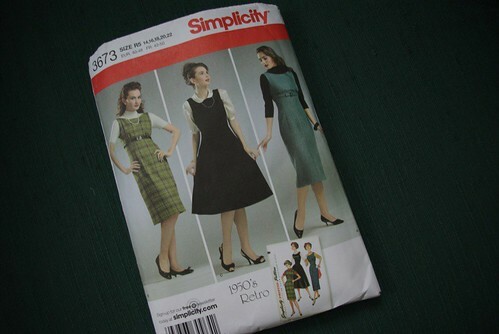 The pattern was McCall's M5322 version A without the trim. I bought my first sewing machine in May with some hard-earned stage management pay. 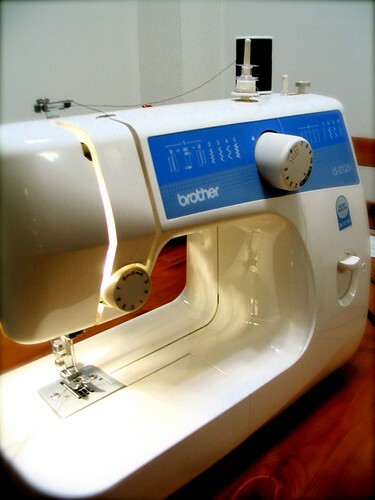 I'm not super fancy when it comes to sewing, so I went for a basic machine, a Brother LS 2125i. I really enjoy this machine, but it's very intuitive and it works almost exactly like my mother's sewing machine that I learned to sew on. 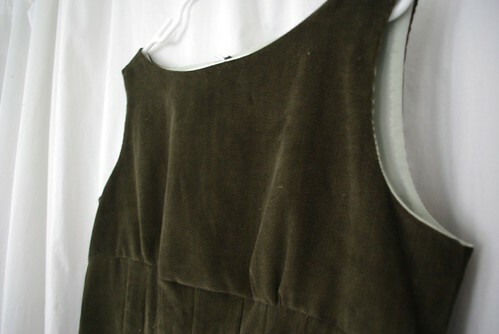 When it comes to choosing projects, I have, up to this point, almost entirely focused on sewing dresses. 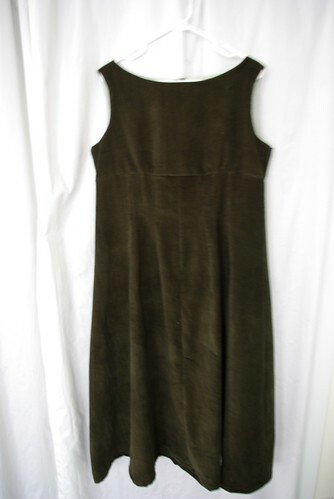 I love vintage dresses, particularly from the 50s, but it's hard to find them in good condition (because really, it'd be fifty years old), and even harder to find them in my size. So I sew them! Having discovered the wonderful world of craft blogs, I have about a billion things I'd like to sew now, but for now I'm still working on a dress. 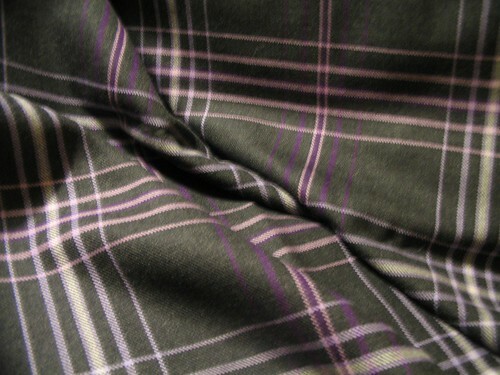 Several years ago, while driving from Napa to Salem, OR for my freshman year of college, my family stopped at the Pendleton factory store and picked up this amazingly beautiful wool fabric. The original intention was to make a skirt for the cold Oregon winters, which is a little funny now that I've lived in Maine and Chicago - no offense Oregon! 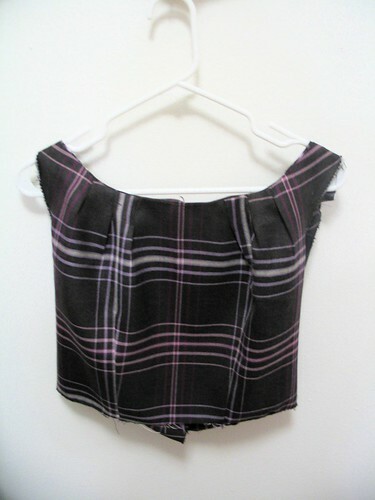 For whatever reason, the skirt never got made. So when I was visiting my mom this summer I dug out out the fabric and the old skirt pattern and snuck it into my suitcase. 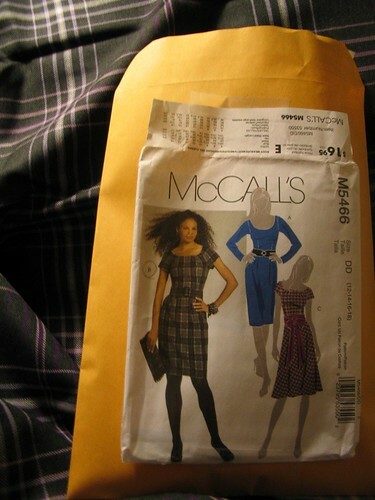 However, I was less enamored with skirt idea by this point, so I did some looking around found this McCall's pattern. I have to admit, I was a tad terrified as I cut out the pieces, because I've never worked with plaid before, so I stared at it for about 15 minutes before I cut anything. Fingers crossed! The cut pieces have been sitting in my sewing box for several weeks and I finally pulled them out tonight and did some sewing. Since space in my apartment is limited, I sew on the kitchen table, but since we use the table I have to set up my machine and put it away each time I want to sew, so its often easier to pull out the knitting (and I am working on sweater #2 - so that has a lot of work to do on it as well). In any case, I finished the bodice tonight and I couldn't be starting this dress at a better time, since I'm seeing plaid everywhere these days from Domino Magazine to CBS Sunday Morning. Apparently the design world is mad about plaid!